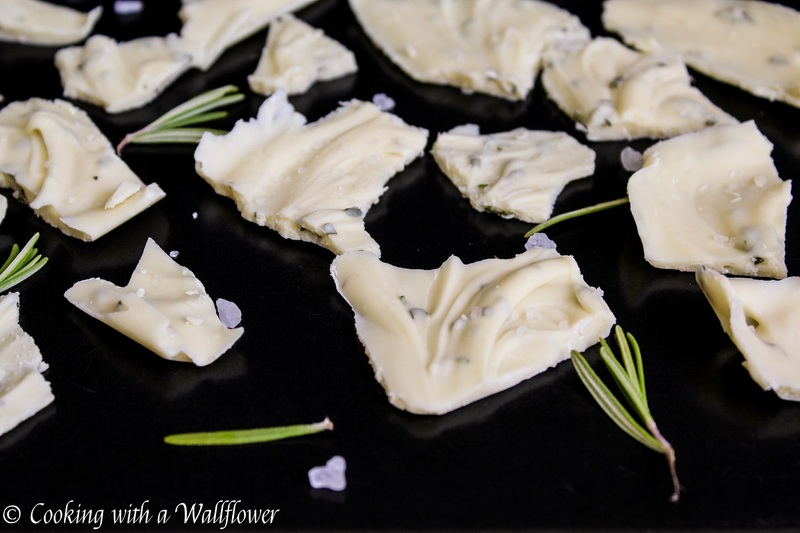 White chocolate infused with fresh rosemary and topped with sea salt. 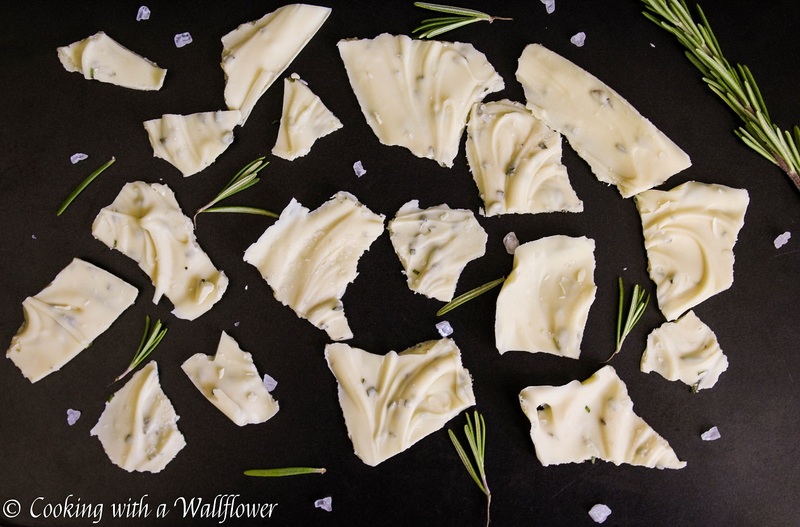 This rosemary sea salt white chocolate bark is the perfect treat for spring. 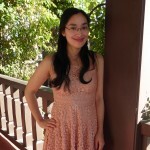 I have been waiting for days to introduce this little spring treat to you. What better way to enjoy your weekend then with chocolate infused with a hint of spring? 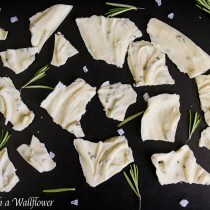 I had my first taste of rosemary sea salt white chocolate two weekends ago when I attended a chocolate sampling event. Before then, I doubt I could even imagine rosemary paired with chocolate. Since then? I’ve been waiting impatiently for my next taste of that amazing combination. How could I forget that distinctive aromatic taste of rosemary bursting with each bite of chocolate? Topped with a little bit of sea salt, this chocolate is really unforgettable. Oftentimes, white chocolate is very sweet, but if you sprinkle a little salt over it, the salt counters the sweetness. The sea salt helps balance out the sweetness of the white chocolate. Don’t believe me? Try it yourself. Or you can always substitute with other types of chocolate though I personally haven’t tried it with out chocolates. It takes just three ingredients to make, and only 5 minutes to prepare. The hard part is waiting for the chocolate to set. Or maybe trying to resist eating them all. I know I had trouble keeping my hands off those little puzzle pieces. Line a 5x9inch loaf pan with parchment paper or wax paper. I personally prefer the wax paper because it’s easier to mold against the loaf pan. 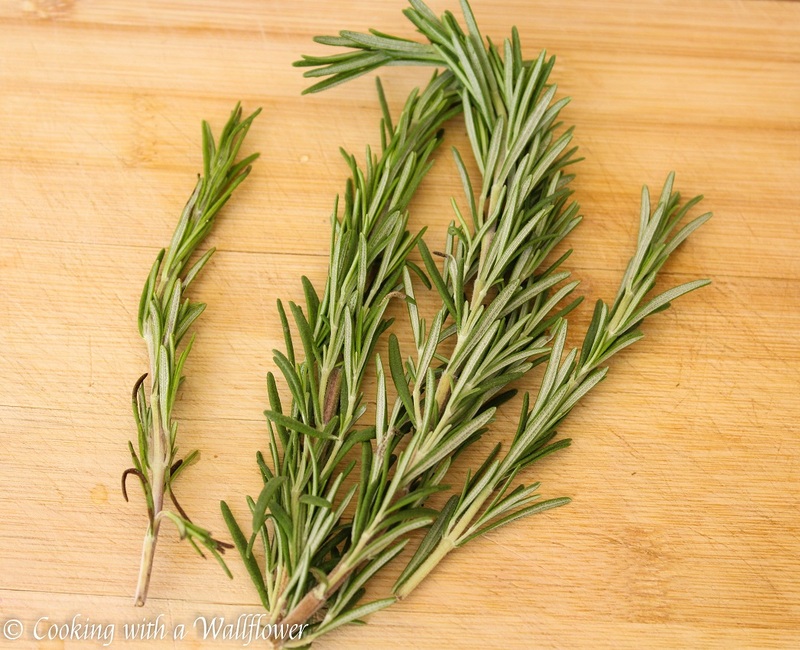 Chop a spring of rosemary as finely as possible. 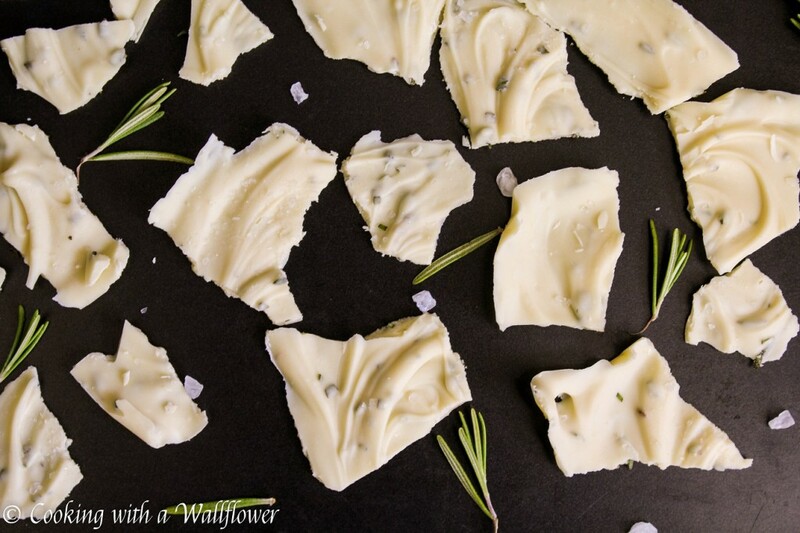 That way when you take a bite of chocolate, you won’t be overwhelmed by the fragrance of rosemary. But as you can see, it doesn’t have to be perfect. 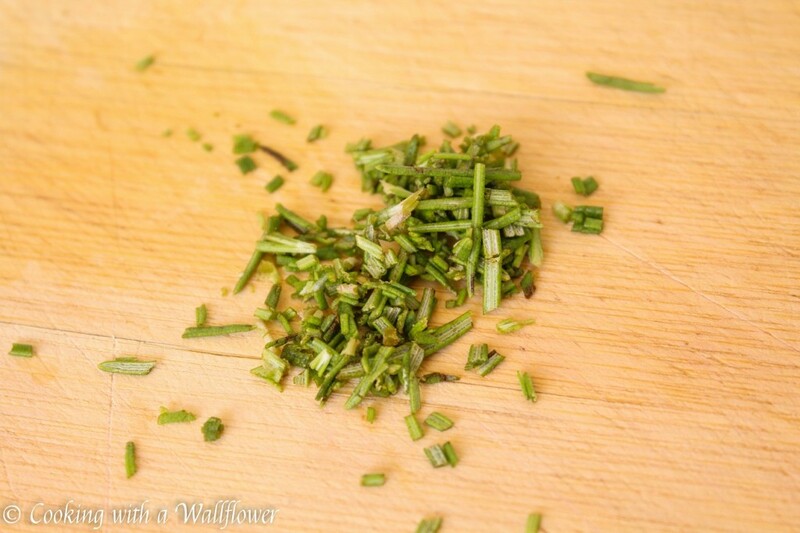 You want about a teaspoon of finely chopped rosemary. Melt down the white chocolate according to the package. I melted my chocolate by heating it in the microwave in 15 second bursts, stirring in between, until the chocolate has completely melted and appears smooth. 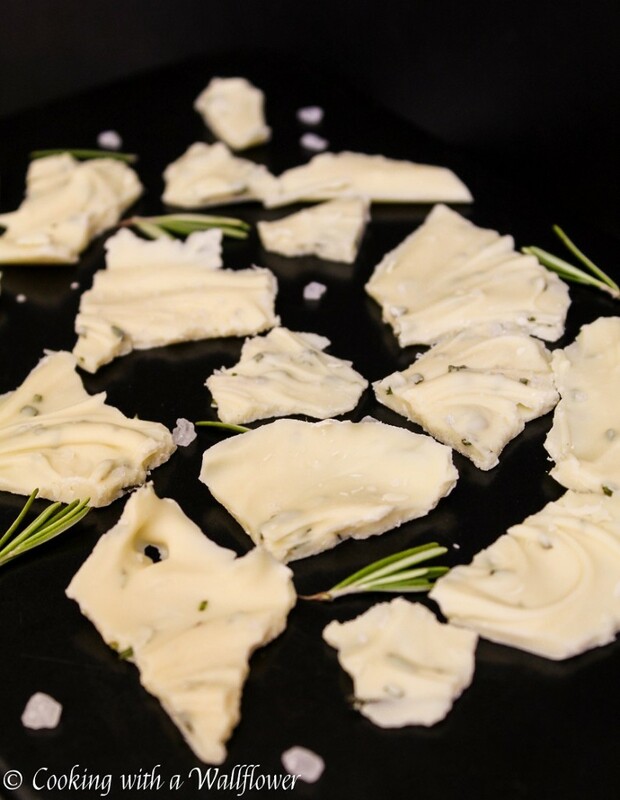 Stir the rosemary into the melted white chocolate until it is as well combined as possible. Now, pour the white chocolate into the loaf pan, spreading the chocolate as thinly as possible with a spatula. Sprinkle finely grated sea salt over the chocolate. You want grounded sea salt, not rocks. Otherwise you’ll have a mouthful of salt. Refrigerate the chocolate for at least an hour until the chocolate has solidified. Once the chocolate has hardened, you can break the chocolate into pieces. I love the jigsaw puzzle pieces! The chocolate can sometimes melt while left at room temperature so it’s better to store the chocolate in an air tight container in the fridge until ready to serve. The flavors of rosemary and sea salt actually enhances the longer they’re in the refrigerator. You might find that the chocolate is a little hard straight out the refrigerator. You can set it out for a few minutes before biting into them. These little chocolate barks are perfect as spring gifts too! Come me join me and my friends at Fiesta Friday where you can more delicious recipes! Line a 5x9inch bread pan with parchment paper and wax paper. Melt the white chocolate in the microwave or in a double boiler according to the directions on the package. 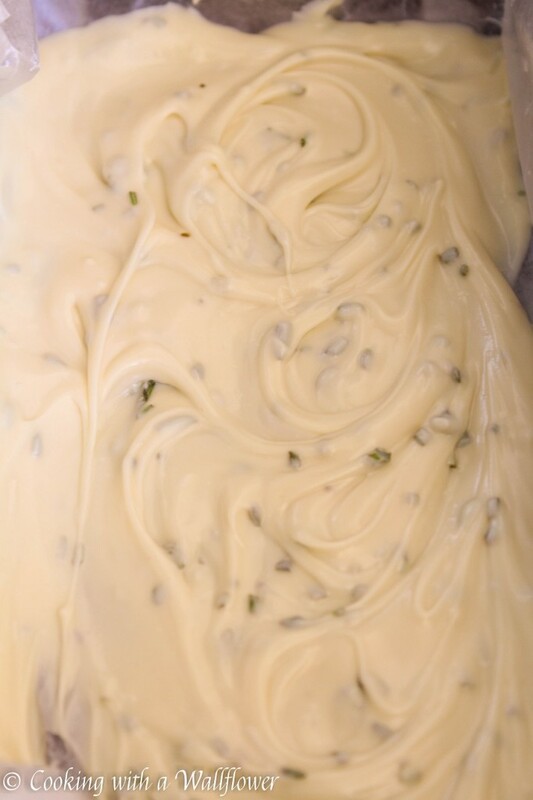 Mix the finely chopped rosemary in with the white chocolate until well combined. Pour the chocolate into the bread loaf pan and spread the chocolate evenly with a spatula or a spoon. Sprinkle the sea salt over the chocolate as evenly as possible. Refrigerate the chocolate for at least an hour. Once the chocolate has solidified, break the chocolate into pieces. Store the chocolate in an air tight container in the refrigerator until ready to serve. This entry was posted in Chocolate, Gluten Free, Homemade Gifts, Spring Cravings, Vegetarian and tagged chocolate, dessert, gluten free, quick and easy, spring, vegetarian. Yum this sounds good. I wouldn’t have thought to put rosemary with chocolate. I also love the idea of chocolate tasting party! I would never leave. Oh my what a creative flavour combination! It sound so simple and delicious 🙂 And the bark looks so beautiful photographed on the black background. This would be such a good gift! Though it does soften a bit at room temperature… have you found that dark chocolate bark is alright to store at room temperature? Andrea, I would never have thought of that combo but it sure looks tasty! Just saved 🙂 thanks for sharing. This sounds so delicious! I am going to try it! 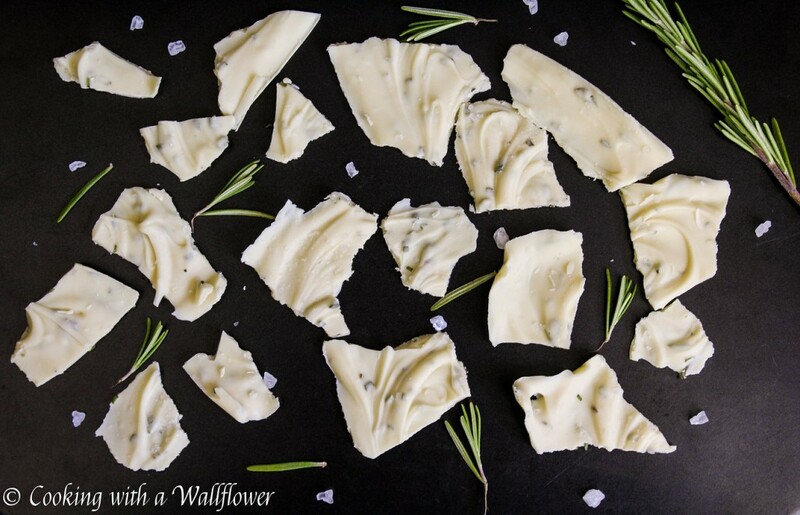 Do you think dark chocolate would overwhelm the rosemary?